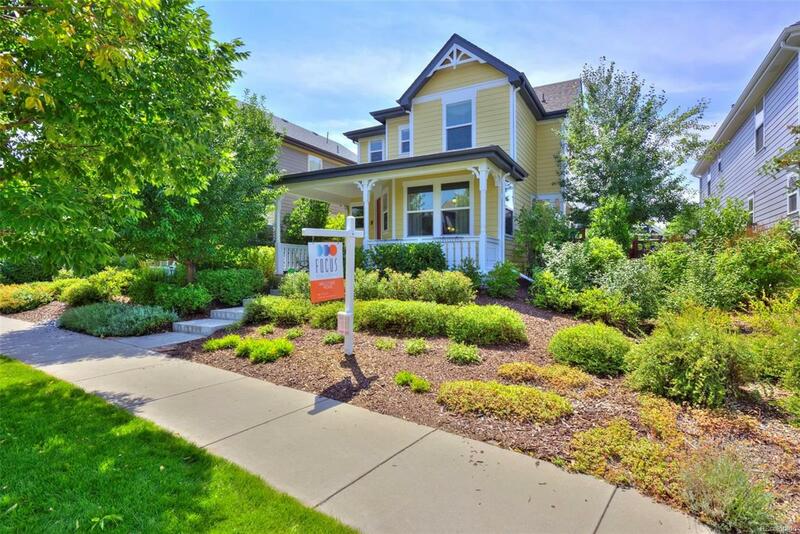 Stapleton two-story in a walkable location just 3 blks to F-15 Pool & close to the Eastbridge Town Center & Stanley Marketplace for shopping, dining, and grocery. A freshly painted exterior and a peaceful front porch surrounded by lush landscaping welcome you. Inside, the open concept floor plan offers a well-appointed kitchen with stainless appliances, granite counters, and an island with seating that is open to the dining room and living room with cozy gas fireplace. A door opens to the covered patio and side yard where you can relax, play, and entertain. Upstairs a sun-filled master suite features a walk-in closet and private bath with dual sinks and a soaking tub while two perfectly sized secondary bedrooms are served by a full hallway bath. A laundry room completes this level. Back downstairs, just off the kitchen, an attached two-car garage offers abundant storage. The East side yard awaits your green thumb and would make a fantastic place for an herb & vegetable garden.